I just realized that I hadn’t yet shown you all the hysterical cookie monster cupcakes that we made for my daughter’s second birthday last week. Her favorite sesame street character is “Cookie” so when I saw a photo of these online, I knew what needed to be done. Then I just had to sweet talk my husband into helping me (he was going to bake a cake). But it didn’t take long to get him on board because really these are just so fun to make!! Oh to be two and have such a fun birthday treat! These are so effective and really not that hard to make. There are tons of tutorials out there in the online world. I even watched a couple of videos on Youtube to see some done in real time. There are a number of variations, but we were definitely happy with ours. So obviously you will need some cupcakes. We thought that the larger cupcakes looked the best in the end, so double up those scoops and make some big cupcakes! I went to the store and bought some royal blue food coloring by Wilton which for the record did NOT stain anything. Other people were worried about that, but I think paying for the quality dye did the trick. I bought some icing bags and a tip for “grass”. I can’t remember the tip number off the top of my head but I just looked at a nearby decorating book for a similar style and bought the tip they used for that. My husband whipped up some buttercream frosting which didn’t need to be too stiff. Somewhat…but the joy of this cupcake is that you can be sloppy and it almost helps the look. 😉 The eyes are made from white melting candies and chocolate chips. We used a small bit of the white candies in melted form as a “glue” for attaching the chocolate chips. And the oreo cookies we used were a standard size but we cut them in half. Cookie monster is very distinctive due to his wobbly eyes. So you want to make sure that you deliberately set the eyes askew. 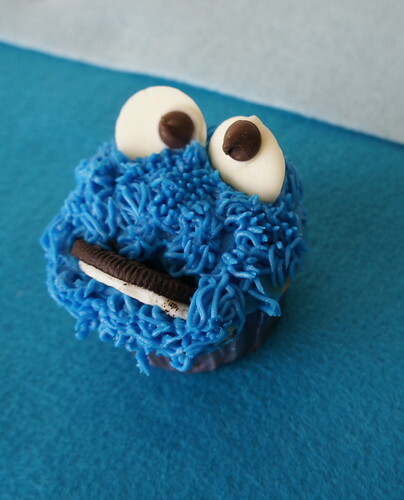 One of the youtube videos I watched said that you put one eye faving down into the frosting and one looking up….Instant presto fabulous cookie monster! And I dare you not to laugh out loud when you put them in! He’s so cute!! I am NO expert on cake decorating. I’ve always wanted to take a class but have never managed to make it happen. And I’ve tried! But I digress. 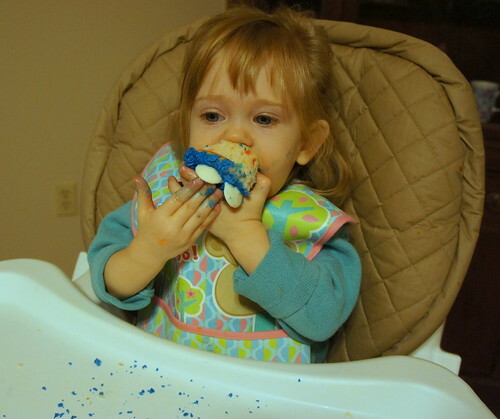 One of the things we learned quickly was that it would be a lot easier to give all the cupcakes a quick layer of blue frosting as a base so that we weren’t trying to fill in every tiny speck with the decorative blue technique. That made life a lot easier. I’m sure that’s no news to someone who’s decorated cakes before but this is what you learn when you do it for the first time. 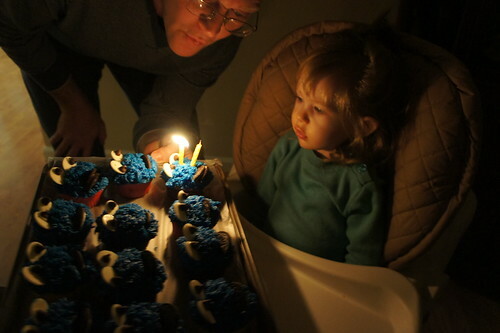 She was admittedly a little baffled by us turning down the lights and singing to her with a plate of cupcakes and some candles but for the adults it was super sweet! And though I was a bit worried, she had no problems eating her beloved Cookie! It’s good to be two. Angela, these are adorable!!! So cute!!! My 2 yo would LOVE these!! He has a cookie monster xmas stocking – and it's SO personality appropriate! Nice work – looks so yummy! I can't begin to imagine the sugar rush that comes with one of those! They are such funny cakes! I love all the Cookie faces and great birthday cake idea! Those are adorable! If my son saw those, they would be on my to do list. Kids birthdays are perfect for learning cake decorating. I've made a variety of cakes from wilton pans and even ventured into marshmallow fondant covered cakes this year. Your kids don't notice any mistakes and just love that you made their cake for them. so cute! they look awesome too. quilter and baker! multi-talented! this is purely wonderful! Yes, they definitely make smiles happen! i LOVE them, and they look like they were a hit 🙂 love her with the necklaces on 🙂 and i agree- 2 is good!! adorable and so creative. I have pinned this for sure! Love them! 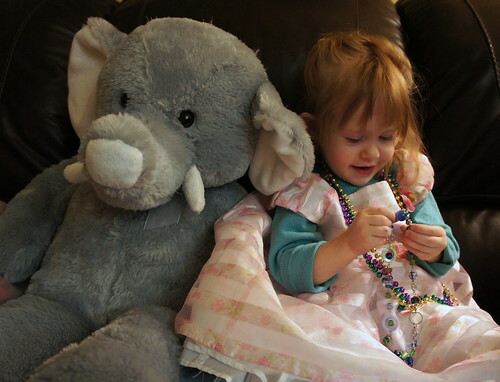 Your daughter is sooo cute, she looks a lot like the olsen twins here!! 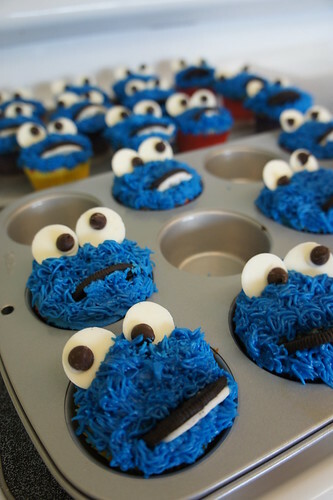 LOVE these cupcakes! Such a cute idea!! Wooow!!! It is so amazing!I've never seen such ideas, you've done greeeeeat work!!! May I take a photo and show it my friends? 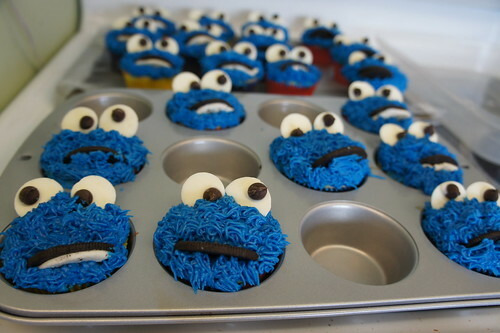 Cookie Monster was also my favorite- still is! I think I liked his blobby shape. But I have this feeling it's because he didn't speak very proper English, and growing up in an immigrant household, I could identify with that. 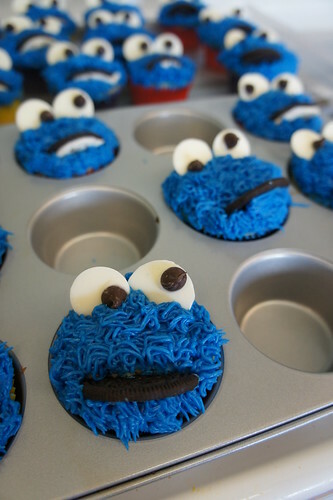 You have made the coolest cupcakes ever! 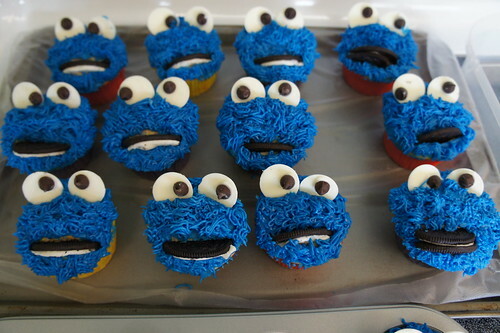 I LOVE the Cookie Monster! Incredible!